An impressive-sounding formant filter - the ability to morph between vowel sounds sets it apart from its competitors. The presence or wet/dry control that features on the desktop version is missing on the Eurorack module. Overloading the filter produces white noise, not ideal for a live performance. 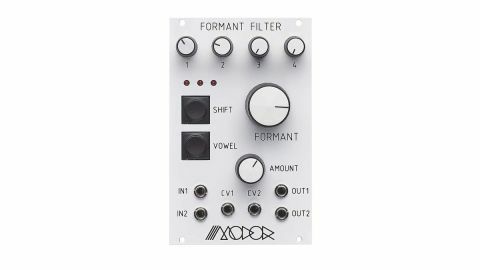 Modor, a new synth developer from Belgium has taken the formant filter from its flagship NF-1 synth and produced its first Eurorack module. What’s a formant? The dictionary defines it as ‘each of several prominent bands of frequency that determine the phonetic quality of a vowel’. Basically, a formant filter simulates the human vocal system. This effect is created by four-band pass filters working in parallel; the frequency of these bands can be adjusted with the four knobs (though this is defined as an ‘expert level feature’, for the beginner, presets are available). What sets the Modor filter apart from other quad-bandpass filters is the ability to smoothly morph between three of these settings using the satisfyingly large knob or the two-CV inputs (with attenuator). Twiddling the Morph knob activates one of the three LEDs indicating left/mid/right position and the vowel button is then used to toggle through the presets. Sadly there is no indicator. With a slow LFO into the CV input, a good approximation of speech is achieved. The shift button is used for fine tuning of each filter’s level and the overall vowel level. Caution must be exercised here; if the levels hit too high, the built-in compressor will kick in to save your ears and the signal becomes a burst of white noise. This feature could certainly cause issues in a live context. Careful prep is essential with this one. If you do successfully adjust the presets, one set of 10 can be saved between power cycles. So, how does it sound? Pretty great actually. The filter needs a lot of harmonics to bite into to make it really shine, so saw waves or white noise are recommended. Dubstep basslines are easily produced by feeding in a low octave saw but subtler string like tones can also be achieved with different input sources, and we coaxed some classic ’90s IDM sounds out. You can also create a plethora of spooky voices. Unlike its predecessor on the NF-1 there’s no dedicated presence control to adjust the level of filtering applied to the signal. This is a shame but we found using a dual low/high pass filter with plenty of resonance before the Modor filter gave a lot of extra control. This is a dual filter with two ins and outs and two CV inputs; these can be used together for a stereo effect or individually for two-voice polyphony, though both filters share vowel selection and morph control. As is often the case when synth makers move into Eurorack there’s a shortage of CV control. A dedicated presence control with CV input would’ve been handy but it’s a minor quibble on a great sounding filter.